LOVING THE LIFE I LEAD! The Gateway Terrace apartments, where I live, has a section that we refer to as The Point which is at the far east end. It juts out into Karen Bay in the New River just beyond our pool. Most late afternoons and/or early evenings a group of residents come down to The Point and spend an hour or two just relaxing, talking and many bring their dogs-- more about the dogs in part 2. Yesterday was a beautiful perfect day with temperatures in the high 80s, a cool breeze off the inter-coastal and a blue sky with wisps of clouds. (So far our rainy ‘season’ has been pretty dry.) As always, more during ‘season’ than now, the boats and people were out on the water including a group having a party on a yacht. 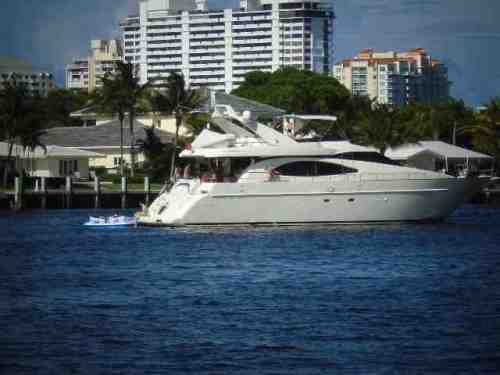 As I was looking at the boats one came along with 2 water skiers behind it--a perfect ad for living in Fort Lauderdale!